SpaceX's Red Dragon concept would launched a Dragon-based spacecraft to Mars and use the capsule's thrusters to make a landing. 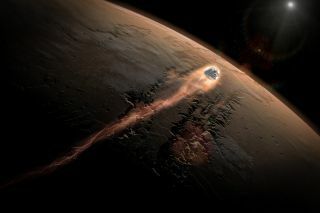 This artist's illustration shows how Dragon could enter Mars' atmosphere. SpaceX has successfully returned Dragon capsules to Earth during space station resupply missions for NASA. SpaceX isn't the only nongovernmental organization with its eyes on Mars. The Hawthorne, California-based SpaceX announced today (April 27) that it plans to start launching its robotic Dragon capsules to Mars as early as 2018, to help lay the groundwork for eventual human missions to the Red Planet. The Netherlands-based nonprofit Mars One is working toward this goal as well. The group aims to launch four astronauts toward the Red Planet in 2026, and four more every two years thereafter. There are no plans at the moment to bring any of these pioneers home. Mars One has estimated that it will cost about $6 billion to get the first four pioneers on the Red Planet. The group intends to cover most of this cost (which also takes into account planned robotic precursor missions in 2020, 2022 and 2024) by staging a global media event around the project, from astronaut selection, to launch, to the settlers' life on Mars. Mars One has faced questions about the feasibility of its plans, and the group has already pushed the anticipated first crewed launch back by two years. But Mars One's leaders say they're still committed to the overall goal of Red Planet colonization, and will remain committed even if the timeline has to be pushed back again. Another much-ballyhooed private Mars project has apparently gone belly-up, however. In 2013, American millionaire Dennis Tito's nonprofit Inspiration Mars Foundation announced its "Mission for America," a plan to send two people — preferably a married couple — to and from the Red Planet. This would be a flyby trip, with no landing on Mars. Tito — who in 2001 became the world's first space tourist when he paid his way to the International Space Station — said he hoped the Mission for America would inspire excitement about space exploration and help test out technologies needed for future crewed journeys to the Red Planet. The original plan called for the mission to launch in January 2018, with a backup opportunity in 2021. But it doesn't look like the Inspiration Mars Foundation will meet either of those targets, or will get off the ground at all. The organization's website is defunct, and Inspiration Mars hasn't said anything via its Twitter account since May 2014. Such planning by private organizations occurs against the backdrop of government-sponsored Mars exploration, which has been proceeding for more than half a century. NASA currently has five active spacecraft at the Red Planet (three orbiters and two rovers), and the agency plans to launch a robotic lander in 2018, a life-hunting rover in 2020 and, possibly, another orbiter sometime in the 2020s. India's Mangalyaan orbiter arrived at the Red Planet in 2014, and the European Space Agency's (ESA) Mars Express probe has been circling the planet since 2003. The first phase of the European-Russian ExoMars mission launched an orbiter and a landing demonstrator last month, and the second phase will send a life-hunting rover toward Mars in 2018 if current schedules hold. Crewed missions are on the horizon in the government sphere as well. For example, NASA is working to get astronauts to the vicinity of the Red Planet by the end of the 2030s, and the agency ultimately intends to set up a research base on the Martian surface. This ambitious and expensive effort will likely require significant international collaboration, NASA officials have said.